If you are looking for networking opportunities to market products, solutions or services in Maryland, United States, Blue Mail Media’s Maryland Business Executives Email Database can be a significant enabler for your sales and marketing teams. We provide marketers with high-quality database based on their industry, area of operations, marketing objectives and so on. Whether you wish to connect with your target market via telephone, email or mail, our database covers complete marketing information to meet the purpose. Blue Mail Media has been as a reliable database vendor among the US businesses. Over the years, we have developed thorough understanding of the marketing challenges that exist in various industries, and thus, we provide our clients enough flexibility to choose from our pre-packaged Maryland Business Mailing List or get a customized list designed based on their specific preferences. Blue Mail Media has been able to establish a strong data partners’ network across many regions which enables us to serve clients without any geographical barrier. 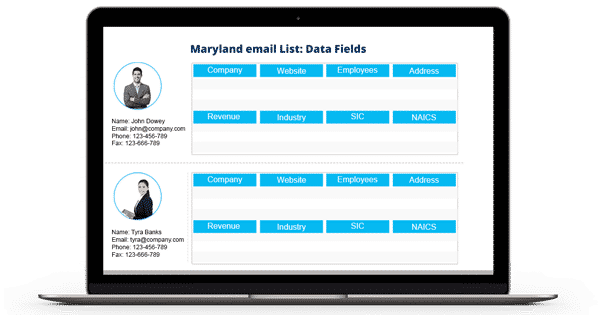 Irrespective of the region or industry you operate in, we can help you with qualitative database of Maryland Business Executives Email Addresses.